NSW Police have today honoured Curtis Cheng, the police accountant shot dead by a 15-year-old boy at Parramatta two weeks ago, at a funeral in Sydney. 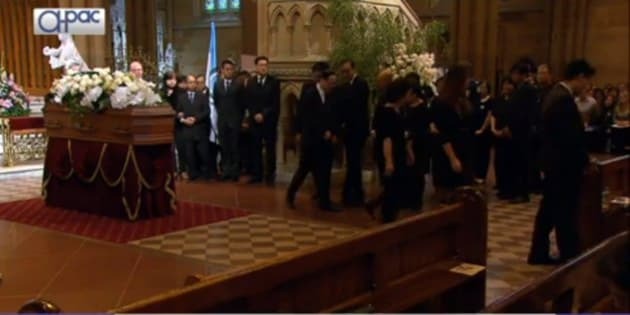 Family, friends and colleagues came together at St Mary's Cathedral. Police Commissioner Andrew Scipione read the Service Valedictory, honouring Cheng and his family, and also posthumously awarding Cheng a Commissioner's Commendation for Service for Outstanding Duty to the NSW Police Force. "Improbable and unjust things happened... Curtis was one of our own, one of our friends," Scipione said. "We will always remember Curtis... Curtis took great pride in his performance, developing a reputation for producing work that could be trusted. In an accountant's world, he was gold... Curtis was admired and respected by his colleagues, a gentle man in every sense. Hard working, measured but unfailingly positive." Scipione shared anecdotes about Cheng's apparently infamous dancing, but was visibly upset at having to read a eulogy for one of his police employees. "I can't describe the devastation inside police headquarters and right across the NSW Police Force. The gentlest of friends lost to an act of terror. A man, the manner of whose death stands in the starkest contrast to the gentle, honourable way that he lived his life," he said. "But in the aftermath of this tragedy, my officers and I have been struck by the strength and unity of the Cheng family. Not an ounce of hate despite this senseless crime. At a time when they deserved our shoulders for support, they have shown a strength and grace of their own, an example to the rest of us, showing the way." "There cannot be any one of us, least of all Selina, Zilvia and Alpha, for whom Curtis’s death is not painful and incomprehensible. We meet it with grief and tears, shock and despair, hurt and anger. It makes no sense. Perhaps time will provide some answers. Perhaps it will dull the pain. But what cannot be allowed to be dulled is the contribution Curtis made." Cheng's son, Alpha, delivered a eulogy on behalf of the family. He spoke of his father working two jobs in Hong Kong to save money for the family to emigrate to Australia and shared some treasured memories. "He was the go to person for his colleagues for his reliability and resourcefulness," Alpha said. "Above all, dad was a family man and always put us first. He devoted so much time to my sister and I, effort into understanding us as individuals. We have great memories of him cheering us on at Saturday sport, playing Playstation or Age of Empires with him." "He has set a tremendous example for us as a family." Family and friends formed a silent procession to leave white flowers on Cheng's coffin, as prayers and hymns rang through the cathedral. At the conclusion of the service, police will form a guard of honour outside the church, after which officers will line College Street as the procession departs. Police this week charged two men in connection to the shooting murder. A 22-year-old Merrylands man was arrested on Thursday morning by police attached to the Middle Eastern Organised Crime Squad and investigators from the Joint Counter Terrorism Team in Sydney. He is facing firearms charges and a charge of hindering police. An 18-year-old Wentworthville man in custody since October 7 will be charged a commonwealth charge of aid, abet, counsel and procure the commission of a terrorist act. Both men faced Sydney courts on Friday and were refused bail.